For the character in Scott Pilgrim, see List of Scott Pilgrim characters. Neil Young, formerly of Buffalo Springfield, joined CSN months later for their second concert at Woodstock and subsequent album Déjà Vu. Stills played bass, guitar and keyboard on the title track and electric guitar and piano on "Helpless". The album sold over eight million copies. In its wake all four members of Crosby, Stills, Nash & Young (CSNY) released solo albums that reached the top 20. 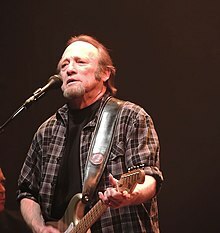 Stills's first solo album, Stephen Stills, went gold and is the only album to feature both Jimi Hendrix and Eric Clapton. Its hit single, "Love the One You're With", became his biggest solo hit, peaking at number 14 on the Billboard Hot 100. A string of solo albums, and a band with Chris Hillman called Manassas, followed in 1972. In summer 1974 Young reunited with CSN after a four-year hiatus for a concert tour which was recorded and released in 2014 as CSNY 1974. It was one of the first stadium tours and the largest tour the band has done to date. CSN reunited in 1977 for their album CSN, which became the trio's best-selling record. CSN and CSNY continued to have platinum albums through the 1980s. Stills's solo career and bands have combined sales of over 35 million albums. Stills was ranked number 28 in Rolling Stone's 2003 list of "The 100 Greatest Guitarists of All Time" and number 47 in the 2011 list. He became the first person to be inducted twice on the same night into the Rock and Roll Hall of Fame for his work with CSN and Buffalo Springfield. According to Neil Young, "Stephen is a genius." Stills was born in Dallas, Texas, the son of Talitha Quintilla (Collard) and William Arthur Stills. Raised in a military family, he moved around as a child, and developed an interest in blues and folk music. He was also influenced by Latin music after spending his youth in Gainesville and Tampa, Florida; Covington, Louisiana; Costa Rica, where he graduated from Lincoln High School, Panama Canal Zone; and El Salvador. Stills also attended Admiral Farragut Academy in St. Petersburg, Florida, and Saint Leo College Preparatory School in Saint Leo, Florida. Stills is also an avid sailor. Stills dropped out of LSU in the early 1960s. He played in a series of bands, including the Continentals, which then featured future Eagles guitarist Don Felder. Stills also sang as a solo artist at Gerde's Folk City, a well-known coffeehouse in Greenwich Village. Stills eventually ended up in a nine-member vocal harmony group, the house act at the famous Cafe au Go Go in NYC, called the Au Go Go Singers, which included his future Buffalo Springfield bandmate Richie Furay. This group did some touring in the Catskills and in the South, released one album in 1964, then broke up in 1965. Afterwards, Stills, along with four other former members of the Au Go Go Singers, formed the Company, a folk-rock group. The Company embarked on a six-week tour of Canada, where Stills met a guitarist named Neil Young. On the VH1 CSNY Legends special, Stills said that Young was doing what he always wanted to do, "play folk music in a rock band." The Company broke up in New York within four months; Stills did session work and went to various auditions. In 1966 he convinced a reluctant Furay, then living in Massachusetts, to move with him to California. Stills, Furay, and Young reunited in Los Angeles and formed the core of Buffalo Springfield. Legend has it that Stills and Furay recognized Young's converted hearse and flagged him down, a meeting described in a recent solo track "Round the Bend". The band would release three albums: Buffalo Springfield, Buffalo Springfield Again, and Last Time Around, and enjoy only one hit single, the Stills-penned "For What It's Worth" before disbanding. A Stills song from their debut album, "Sit Down, I Think I Love You," was a minor hit for the Mojo Men in 1967. After the disintegration of Buffalo Springfield, Stills played on the Super Session album with Al Kooper and joined up with David Crosby, who had recently been ejected from the Byrds in the autumn of 1967. At a party in Laurel Canyon, Crosby was introduced to Graham Nash by a mutual friend, Cass Elliot (formerly of the Mamas and the Papas), and Nash found himself soon joining in singing with Crosby and Stills. Renditions of the latter's "You Don't Have to Cry," led to the formation of Crosby, Stills & Nash. Several of Stills's songs, including "Suite: Judy Blue Eyes" and "You Don't Have To Cry" on the group's debut album were inspired by his on-again off-again relationship with singer Judy Collins. In a 1971 interview in Rolling Stone the interviewer noted, "so many of your songs seem to be about Judy Collins." Stills replied, "Well, there are three things men can do with women: love them, suffer for them, or turn them into literature. I've had my share of success and failure at all three." The cover photo pictured on the debut was taken on the back porch of a house in West Hollywood, which was torn down the next day. Wanting to be able to tour and needing additional musicians, the band invited Neil Young to join them for their subsequent tour and second album to make the group the quartet Crosby Stills Nash & Young. Having played at the Monterey Pop Festival with Buffalo Springfield, and both Woodstock and Altamont with CSNY, Stills (along with Crosby) performed at all three of the iconic U.S. rock festivals of the 1960s. In the wake of CSNY's success, all four members recorded high-profile solo albums. In 1970, Stills released his eponymous solo debut album which featured guests Eric Clapton, Jimi Hendrix, Cass Elliot, Booker T. Jones and Ringo Starr (credited only as "Richie") as well as David Crosby, Graham Nash, Rita Coolidge and CSNY drummers Dallas Taylor and Johnny Barbata. It provided Stills with the U.S. No. 14 hit single "Love the One You're With." Stills followed this with Stephen Stills 2, which featured "Change Partners." Even though the song was written before CSN formed, Nash saw it as a metaphor for the many relationships in CSNY. In 1971, Stills played guitar for the Bill Withers album, Just as I Am, including the Grammy-winning song, "Ain't No Sunshine". In late 1971, Stills teamed up with ex-Byrd Chris Hillman to form the band Manassas. Their self-titled double album was a mixture of rock, country, blues, bluegrass and Latin music divided into different sections. All of Stills' albums after Buffalo Springfield had gone either gold or platinum; the Manassas follow-up album the next year Down the Road was his first LP that did not. In 1974 there was a CSNY reunion tour filled arenas and stadiums with sold-out shows but due to lavish overspending by management, the tour actually made little money for the group. The boost in album sales, however, was tremendous. After the 1974 tour, he signed to Columbia Records for three albums: Stills in 1975; Illegal Stills in 1976; and Thoroughfare Gap in 1978. In 1976, Stills attempted a reunion with Neil Young. At one point, Long May You Run was slated to be a CSNY record, but when Crosby and Nash left to fulfill recording and touring obligations, they returned to find the other pair had wiped their vocals from the recordings, as Stills and Young decided to go on without them as the Stills-Young Band. However, Young would leave midway through the resulting tour due to an apparent throat infection. Stills was contractually bound to finish the tour, which he did, but upon returning home, his wife - French singer-songwriter Véronique Sanson - announced she wanted a divorce and wished to move back to France. Stills reunited with Crosby and Nash shortly afterwards, thanks to the efforts of Nash's future wife Susan, who got Nash to forgive Stills for wiping the Crosby and Nash vocals from Long May You Run. This led to the permanent reunion of Crosby, Stills, and Nash in 1977, which persisted until a permanent falling-out between Nash and Crosby in 2016. Neil Young joined the trio for two albums, in 1988 and 1999, and tours in 2000, 2002, and 2006, along with various benefit performances. Also in 1976, Stills played percussion on the Bee Gees' song "You Should Be Dancing". In 1979 he traveled to Havana, Cuba, to participate in the Havana Jam festival that took place between March 2–4, alongside Weather Report, the Trio of Doom, Fania All-Stars, Billy Swan, Bonnie Bramlett, Mike Finnigan, Kris Kristofferson, Rita Coolidge and Billy Joel, plus an array of Cuban artists such as Irakere, with whom he toured the US after the Havana concerts. His performance is captured on Ernesto Juan Castellanos's documentary Havana Jam '79. Also in 1979, Stills recorded one of the first albums recorded entirely digital; however, it remains unreleased, as the record company didn't feel it was commercial enough. The songs recorded for this album include "Spanish Suite" and "Cuba al Fin", which would be released on his 2005 album Man Alive! The album was produced by Barry Beckett. In 1984, Right by You would be the final Stills album to make the Billboard 200 album chart, with Stills Alone issued in 1991. In 1997, Stills became the first person to be inducted into the Rock and Roll Hall of Fame twice on the same night for his work with CSN and Buffalo Springfield. Fender Guitars crafted a custom guitar and presented it to Stills to commemorate the occasion, a Telecaster-style guitar bearing an inscription on the neck plate. 2005 saw Stills release Man Alive!, his first solo offering in 14 years. Man Alive! was released on the small English independent folk rock label Talking Elephant, and was not widely reviewed. The record did not chart on either side of the Atlantic, and was received lukewarmly by the few critics who did review it. Throughout 2006 and 2007, Stills toured regularly as a solo artist with "the Quartet", which consisted of drummer Joe Vitale, either Mike Finnigan or session player Todd Caldwell on keyboards, and either Kevin McCormick or Kenny Pasarelli on bass. On May 28, 2007, Stills sang the national anthem for Game 1 of the 2007 Stanley Cup Finals between the Anaheim Ducks and Ottawa Senators in Anaheim, California. On December 17, 2007, Graham Nash revealed on Larry King Live that Stills had been diagnosed with early stage prostate cancer and that his operation would take place on January 3, 2008, which is Stills' birthday. Stills said later in January 2008 that he had come through the operation with "flying colors." Stills toured Europe as a solo artist for the first time during October 2008. In 2011, Stills contributed a song, "Low Barefoot Tolerance," to the soundtrack of a documentary produced by J. Ralph, Wretches & Jabberers. On August 27, 2013, Stills released the album, Can't Get Enough with Kenny Wayne Shepherd and Barry Goldberg as the blues band the Rides. The band toured to support this release in 2013. On August 12, 2014, Watsky released the album All You Can Do, featuring a song with Stills, "Cannonball". Stills was involved with musician Judy Collins from 1968 to 1969 and wrote the song "Suite: Judy Blue Eyes" for her. He dated actress and singer-songwriter Nancy Priddy, who was the inspiration for his Buffalo Springfield song "Pretty Girl Why". Stills also had a short-term relationship with Rita Coolidge, as had Graham Nash, which apparently led to the initial breakup of CSN, in 1970. During a Manassas tour in France, Stills met his first wife, the singer-songwriter Véronique Sanson. They were married on March 14, 1973. Their son Christopher was born in 1974. They divorced in 1979. In 1976, Stills told Rolling Stone, "My hearing has gotten to be a terrible problem. If I keep playing and touring the way I have been, I'll go deaf." In 1988, he married Thai model Pamela Anne Jordan, with whom he had a daughter, Eleanor. His third wife is Kristen Hathaway (Kristen Stills), whom he married on May 27, 1996. Stills's son, Justin Stills, was born in 1972 to Harriet Tunis. Justin was critically injured while snowboarding on Mt. Charleston, just outside Las Vegas, in 1997. An episode of Discovery Health's documentary series Trauma: Life in the ER featured his treatment and recovery. Another son, Henry, has been diagnosed with Asperger syndrome  and is profiled in the 2007 documentary Autism: The Musical. Stills' daughter Eleanor is a photographer and graduate of Art Center College of Design in Pasadena. Since Eleanor's graduation, she has been responsible for all recent Crosby, Stills & Nash photography. Stills has another daughter, Alex, who attends Emerson College in Boston, Massachusetts. His son Chris and daughter Jennifer are both recording artists. His youngest son, Oliver Ragland, was born in 2004 and named in honor of Neil Young, whose maternal family name is Ragland. Like all the other members of CSNY, Stills has long been involved in liberal causes and politics. In 2000, he served as a member of the Democratic Party credentials committee from Florida during the Democratic National Convention, and was a delegate in previous years. In December 2018, Stills received an Honorary Doctorate in Music from the University of Florida, Gainesville where he was a speaker at the commencement ceremony. Stills is a guitarist whose music draws from myriad genres that include rock and roll, blues, gospel, country and folk music. In addition, Latin music has played a key role in both his approach to percussion and guitar and he is also a multi-instrumentalist, capable of playing keyboards, bass, percussion, congas, clavinet, electric piano, piano, organ, banjo and drums. For the CSN debut album in 1969, Graham Nash commented that "Stephen had a vision, and David and I let him run with it." Stills played every instrumental part on Crosby, Stills and Nash with the exception of some guitar by Crosby and Nash, and drums by Dallas Taylor. See also discographies for Crosby Stills Nash & Young, Buffalo Springfield and Manassas. "Nothin' To Do But Today"
"Rock & Roll Crazies Medley"
"12/8 Blues (All the Same)"
^ "Stephen Stills And Judy Collins Celebrate 50 Years Of Musical Friendship With First-ever Album Together - 'Stills & Collins' Out September 22 (Wildflower/Cleopatra)". stephenstills.com. Stephen Stills. June 20, 2017. Retrieved August 14, 2017. ^ Robinson, Lisa. "An Oral History of Laurel Canyon Music Scene". Vanity Fair. Retrieved January 2, 2016. ^ Whitburn, Joel (2004). The Billboard Book of Top 40 Hits (8th ed.). Record Research. p. 606. ^ Rolling Stone The 100 Greatest Guitarists of All Time 2003-08-27. ^ Rolling Stone 100 Greatest Guitarists 2011-11-23. ^ Young, Neil. Waging Heavy Peace. Blue Rider Press. ^ Zimmer, Dave. Crosby, Stills & Nash: The Biography, Philadelphia: Da Capo Press, 2008, p. 8. ^ Bradley, William. "'Buffalo Springfield Again' at 50: Meet the (Almost) American Beatles". Huff Post.com. Oath, Inc. Retrieved January 16, 2019. ^ "Round the Bend, Stephen Stills". Genius. Genius Media Group Inc. Retrieved January 16, 2019. ^ Collins, Judy (2011). Sweet Judy Blue Eyes: My Life in Music. New York: Random House. p. 328. ^ "CSN Box Set Tracklist". AlbumLinerNotes.com. Retrieved April 17, 2017. ^ "Engineer Bill Halverson discusses the recording of Bill Withers' classic track, "Ain't No Sunshine", in the November 2012 issue of Mix". Mixonline.com. November 1, 2012. Archived from the original on October 21, 2014. Retrieved August 23, 2014. ^ a b Cameron Crowe "Quick End to a Long Run." Rolling Stone Sep 9, 1976 reprinted in 4 Way Street: The Crosby, Stills, Nash & Young Reader 2004 Da Capo Press. ^ Zimmer, Dave (September 23, 2008). Crosby, Stills & Nash: The Biography. Da Capo Press. ISBN 9780786726110. ^ "Man Alive: Music". Amazon.com. Retrieved August 23, 2014. ^ "Stephen Stills Diagnosed with Prostate Cancer, According to Graham Nash". Rolling Stone. Retrieved December 20, 2007. ^ "Stills back after cancer". Sun Media. Archived from the original on January 15, 2013. Retrieved August 30, 2009. ^ Richie Unterberger, Eight Miles High: Folk-Rock's Flight from Haight-Ashbury to Woodstock (Hal Leonard Corporation, 2003), ISBN 978-0879307431, pp. 120-121. Excerpts available at Google Books. ^ John Einarson & Richie Furay, For What It's Worth: The Story of Buffalo Springfield (Taylor Trade Publications, 2004), ISBN 978-0815412816, p. 261. Excerpts available at Google Books. ^ Rob (March 21, 2014). "Stephen Stills and The Giraffe of Unrequited Love". Retrieved February 22, 2019. ^ "Entre Véronique Sanson et Stephen Stills, une drôle de vie au goût amer". RTL.fr. Retrieved February 22, 2019. ^ Crowe, Cameron. "Quick End to a Long Run". The Uncool. Retrieved January 15, 2017. ^ Zimmer, Dave (2008). Crosby, Stills and Nash: The Biography. Da Capo Press. ISBN 0786726113. ^ The Musician's Family Discusses Their Role in the Recent Miracle Project Movie, Theatre Therapy, and Their Son's Progress. Spectrum Publications, October/November 2008. Retrieved March 10, 2010. ^ "West Coast Music: Stephen Stills Becomes Papa". Noted.blogs.com. October 31, 2004. Retrieved August 23, 2014. ^ "Stephen Stills - Credits - AllMusic". allmusic.com. Retrieved March 8, 2017. ^ Santoro, Gene. "Why Manassas Was Stephen Stills' Best Band". Music Aficionado. Retrieved January 16, 2019. ^ "Gold & Platinum - RIAA". RIAA. Retrieved September 5, 2018. ^ a b c d Fong-Torres, Ben; Fong-Torres, Ben (August 29, 1974). "The Reunion of Crosby Stills Nash & Young". Rolling Stone. Retrieved March 19, 2019. ^ a b c "Gold & Platinum - RIAA". RIAA. Retrieved September 5, 2018. Wikimedia Commons has media related to Stephen Stills.